Hello hello! Thank you guys so much for your sweet, encouraging words yesterday about our big news. David and I looked like two goofy kids with big ol' smiles on our faces as we read through each comment last night. You guys are the best! And all of you are right- while we are so sad to leave our beloved dream ranch, we are certainly excited for the blessings and adventures in front of us. As all of you know (probably better than anyone! ), we've done a lot of work to our house. In fact, we've been consistently improving our 1952 ranch since we purchased it almost two years ago. And we couldn't be more proud of how wonderful our home is. But there are a couple of small projects we want to finish before we put the house on the market. Just so it's in tip top shape for potential purchasers. And one of those small projects? A mini-makeover of our upstairs guest bath. 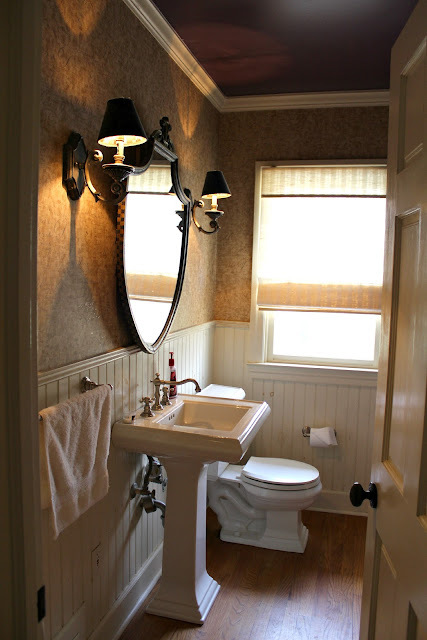 You can see the "before" shot of our guest bath on my house tour page. Interestingly enough, it's one room we literally haven't touched decor-wise since moving in! And it's not like we don't use the space... it's right next to the living room so we use it while we're hanging out in there most nights and we actually used the bathroom as our regular bathroom for the ten or so months our master bath was out of commission due to its renovation! Crazy that we haven't touched it yet, right? It seems especially crazy when you find out the room is a little bold. Like, medieval lighting + mirrors, a gigantic custom plaid shower curtain and a purple ceiling bold. Check it out. Wait, I think we need to see that purple ceiling a little closer in action. It's actually a pretty cute space, even if it's not my style. But I think most buyers would walk into the room and say: Wowza. That's a purple ceiling. And a heavy antique mirror. We might need to rethink this room. So our goal for this space is to tone it down a notch (or two) and make the room more inviting. 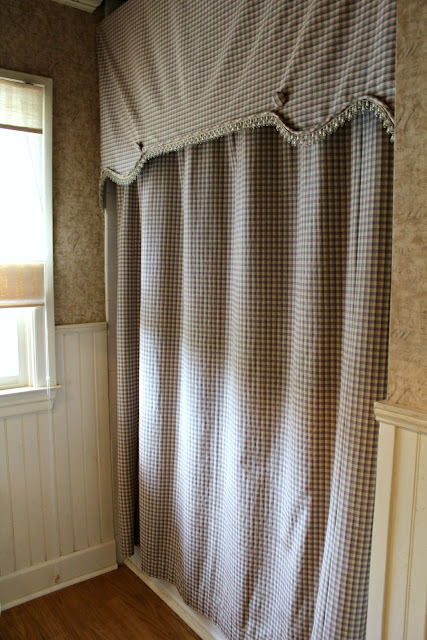 The bathroom has amazing bones- the classic (fabulous) pedestal sink, beautiful polished nickel fixtures, some gorgeous tiling in the shower (that I forgot to take a picture of for you), a good sized linen closet and a gorgeous view of the backyard and pool. I'm lucky I have a lot to work with! *Psst! I updated this list with what we've done so far! Check it out! Not too bad of a list, right? What do you think- did I pick all of the right things to switch up? 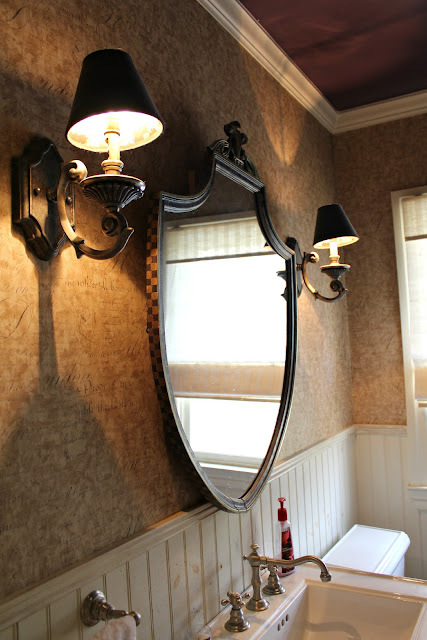 Speaking of, this pretty antique mirror and two sconces are going up on Craigslist today (along with our bronze dining room pendant light you can find here). If you're local to Atlanta and interested, shoot me an email! Psst! 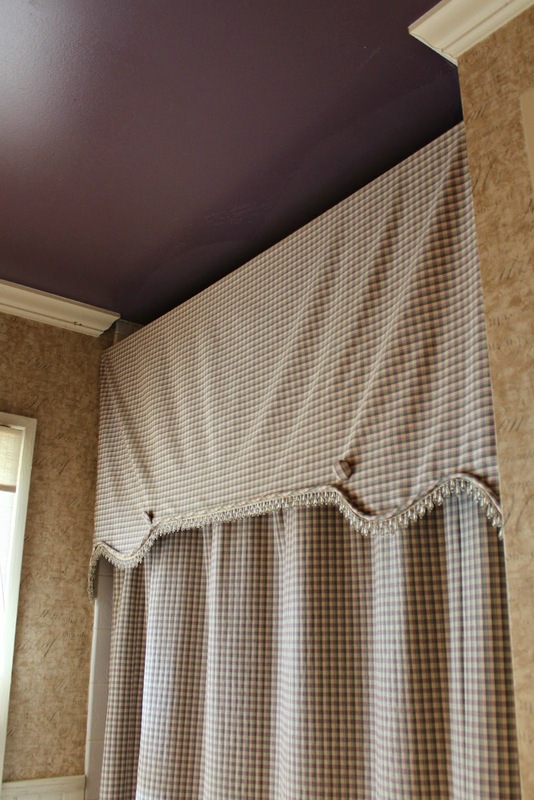 You may have already figured it out, but we won't be going forward with our plans for the laundry room makeover. We are definitely still making a few tweaks to the space though, so stay tuned! I really like the mirror. I don't know that people would be thrown off by that, but the ceiling has to go. Good luck with everything! Staging a home for sale is usually easier than decorating in general because you know you can play it safe on all your choices. Can't wait to read what you do. I can't believe yall are moving!!! Anywhere closer to me?! I know you said South! ;) Im sure your house will be snapped up in no time! Best wishes on the new job and move!!! the purple ceiling is TO DIE FOR! omg. a risk well taken! adore. Awesome!! Can't wait to see the changes you make. Changing the ceiling color will really help! Oh love mini makeovers! I think this will make a huge impact for not making too many changes! Can't wait to see what you do with the space! Is it just me or does that mirror look like it's in the shape of a shield?? You can lighten that up in no time! How crazy to be doing projects to move. . . ahhhh!!! Oh plum, you had your heyday. How much would a white ceiling brighten up that room? Good bones though - at least it's a quick fix! Ahhh congrats!! 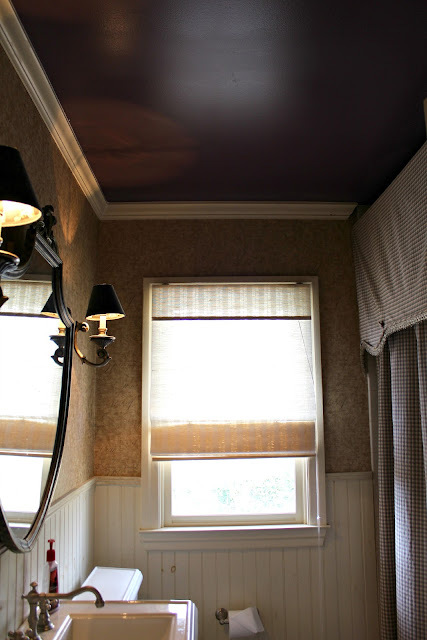 I actually like the purple ceiling, I think if it was paired with not so medieval looking everything else it would be much better :) But I get the neutralizing thing, we painted most of our condo before moving just to make it more appealing.